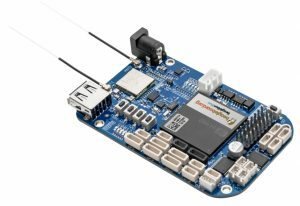 element14, the Development Distributor, is now shipping BeagleBone Blue, the latest offering based on the popular opensource BeagleBone from the BeagleBoard.org Foundation, built specifically for use in the development of robotics and autonomous vehicles. Aimed at Hardware and Software engineers, makers and university education markets, BeagleBone Blue is built around the familiar BeagleBone open hardware computer, and is fully community supported. It’s high-performance and flexible networking capabilities are coupled with a real-time capable Linux system and a set of peripherals suited for building mobile robots quickly and affordably; from precise motor control and feedback to rechargeable, portable power management. The onboard 9-axis inertial measurement unit and barometer enable the development of self-aligning and orientating robotics, whether grounded or air borne, all directed with the support of on-board 802.11/b/g/n and Bluetooth 4.1/BLE wireless technology. BeagleBone Blue uses an Octavo Systems OSD3358 System-in-Package device which includes a TI AM3358 1-GHz ARM Cortex-A8 CPU with 512MB DDR3 RAM, 4GB 8-bit on-board flash storage and power management. One of the key benefits of the TI AM3358 device is that it has two 32-bit programmable real-time units (PRUs) running at 200-MHz, making BeagleBone Blue ideally suited for application in robotics. As ever, getting started with BeagleBone Blue is simple and code development can be started by utilizing a pre-configured WiFi access point, connecting a battery and opening a web browser. BeagleBone Blue is available from Farnell element14 in Europe, Newark element14 in North America and element14 in Asia Pacific. For more information Visit: element14 Community.